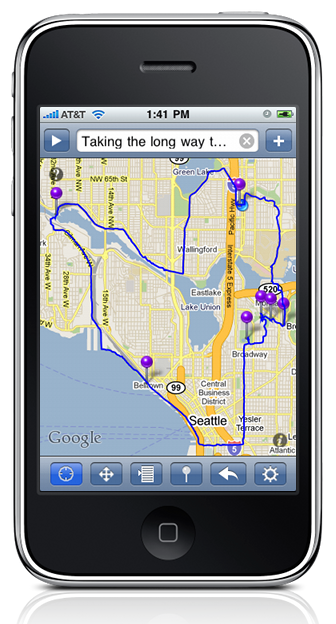 Bike My Way uses the built in GPS of your iPhone 3G or 3GS to record bicycle rides, hikes, and other outdoor travels. You can add waypoints to your route and include photos from the iPhone camera or photo library. Bike My Way allows you to export route data in standard GPX format suitable for use with Google Earth and many web sites. You can send route data via email or upload directly to Everytrail. Once you start recording a route, Bike My Way will continue to acquire location data even when the iPhone goes into sleep mode. You can press the Sleep button (top right button) or just let the screen time out. Don't press the Home button, though. This will cause Bike My Way to exit, and no further locations will be recorded. The iPhone is best suited for casual GPS use. If you want a high degree of accuracy and reliability, you should probably invest in a dedicated GPS unit. On the other hand if you just want to know where you rode, and you already have an iPhone, then you can get useful results without the expense of a dedicated GPS. See the Wiki for a discussion of known issues and a tutorial. If you have questions about using ''Bike My Way'', suggestions for new features, or just want to share a fun bike route, go to the discussion forum. Bike My Way requires an iPhone 3G or 3GS running at least version 3.0 OS. It doesn't run on the iPod Touch or the original iPhone, since these devices lack GPS hardware.